This newly renovated mid-rise hotel is located in the heart of Waikiki near the famous International Marketplace. Located just two blocks from Waikiki Beach, this comfortable and fresh hotel offers spacious accommodations, large lanais in most rooms and the following free amenities: Wi-Fi in the lobby, refrigerator, microwave and coffeemaker or full kitchens. 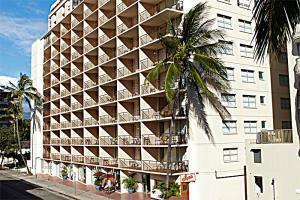 1 block from the International Marketplace and 2 blocks from the Waikiki Beach. Approximately 30 minutes from the Honolulu Airport.